The Spanish Albariño grape is the reigning king of varieties in the country’s Rias Baixas region. Related to the Alsatian Riesling grape, Albariño makes a white wine that usually offers a nice touch of sweetness amid a ton of citrus minerality. The wine’s importer notes that Bodega Don Olegario was started some 60 years ago in the place that Albariño calls home. Don Olegario is a 12-acre single vineyard with vines averaging 30-years of age growing in granitic, sandy soil that drains well. It is one of only a few single estates in Rías Baixas, where vineyard land is often divided among hundreds of growers. The growing is sustainable and harvesting is done by hand. The grapes are fermented in stainless steel tanks. The wine sells in most places online for under $20 and has a well-restrained alcohol content of only 13% abv. This 2015 Albariño pours up pretty in the glass - yellow-gold and a touch of bubbles. The bubbly sensation doesn't last too long, but it's festive while it’s there. The nose brings some citrus - of course - and a smattering of stone fruit and ripe apples. In the mouth, the magic really begins. The acidity is razor-sharp and a complete delight. The bottle should come with a dozen oysters. Flavors of apples and Meyer lemons grace the palate and you simply don't run out of minerals. There's a lot to like here, and it lasts long beyond the sip. Sitting in companionship with the varietal Malbec and Tannat Troon wines, the 2013 Troon Black Label MT Reserve puts the two together. The wine is a co-ferment of 55.67% Malbec and 44.33% Tannat. Those specifics come from Troon Vineyards' general Manager Craig Camp, who calls it "a true marriage of these two complementary varieties." He says they indicate a new path for winemaking at Troon, "including natural yeast and malolactic fermentations and minimal use of new oak." The two grape varieties make Camp think of Cahors and Madiran, and the "black wines" that come from those French regions. They work together as well as they do separately. This wine has an alcohol content of 13.7% abv and retails for $50. The Troon Black Label MT Reserve is dark and foreboding, not just in its blackish color but in its nose and palate. The aromas are savory and earthy; campfire smoke, baseball glove, cedar chest and Kalamata olives chase the blackberry smells around the glass. As for the flavors, black fruit, spices and licorice dominate. A healthy whack of tannins and a vibrant acidity make for some excitement in the mouth. The experience is not soon forgotten, as a lengthy and savory finish just won't go away. Here's a really good IPA from the desert, where they know a thing or two about refreshing beverages. The Coachella Valley Brewing Company makes the Monumentous IPA, a West Coast-style India Pale Ale, double rye and 7% abv. I had it from the bottle at Ray’s and Stark at LACMA, the perfect aperitif for the Guillermo del Toro exhibit. The Thousand Palms product would serve well on the hottest low desert days. It has a nice head, frothy and a piney, hoppy nose that shows elements of caramel, although they are very faint. The hops come from the Pacific northwest and New Zealand. It went well with my tomato and fruit salad, but also fit in with the fries and aioli from the other side of the table. By the way, the name of the beer references the Joshua Tree National Monument nearby. "Get something you've never tried before," said my wife as we scanned the wine list at Moruno, the Spanish restaurant in L.A.'s Original Farmers Market. It’s a great place, with delightful Spanish dishes and an adventurous wine list that leans heavily in the Iberian direction. Since most of the plates we get there are new to me, it makes sense to go with a grape that’s under my radar as well. Hondarribi Beltza, f’rinstance. I have heard of Hondarribi's white counterpart, but was unfamiliar with the red version. It comes from a place called Bizkaiko. Located in Spain's Basque Country, on the nation’s north coast, the Bizkaiko Txakolina region is a collection of more than 80 little communities all growing wine grapes. They make Txakoli wine largely from the white Hondarrabi Zuri grape. This wine is made from the less common red grape, Hondarribi Beltza, grown primarily in the coastal town of Bakio. The waitress at Moruno offered the red Basque wine, and I could not resist. The wine's nose brings dark fruit layered with black olive and bell pepper. Its palate is just as savory, with some earthy blackberry in the balance. The red Txakoli wine was great with the artichokes a la plancha - salty, caramelized exterior with a tender inner. The music that was playing in the restaurant during our meal got high praise from my wife - big Eddie Kendricks fan. I hate to relegate this to a postscript, but I asked for a taste of a vermouth that Moruno has on the menu. It's made by Steve Clifton of Lompoc's Palmina Wines and comes in both red and white. It's on tap in the restaurant from five-gallon kegs. The label images come from Palmina's Twitter feed. The organic Vermina vermouth is a collaboration between Clifton and L.A. restaurateur David Rosoff. It’s part of Rosoff’s effort to bring European bistro dining to Southern California. Clifton reportedly digs around himself in Santa Barbara County to find the herbs he uses in the vermouth. According to the L.A. Weekly, the white vermouth is a blend of pinot grigio and malvasia wines, while the red vermouth adds a touch of Sangiovese for its color. It has a nose of violets and botanicals and shows wonderful freshness on the palate with a strawberry flavor that is carried along by the slightly medicinal notes of the botanicals. There is a wine book available for those who like to immerse themselves in the written word about the subject. And who doesn't? A Perfect Score by Craig and Kathryn Hall traces their 20-year path from amateur winemakers to the recipients of the celebrated 100-point score from Robert Parker's "The Wine Advocate." The hit the magic number twice, in fact, in 2013 and 2015. 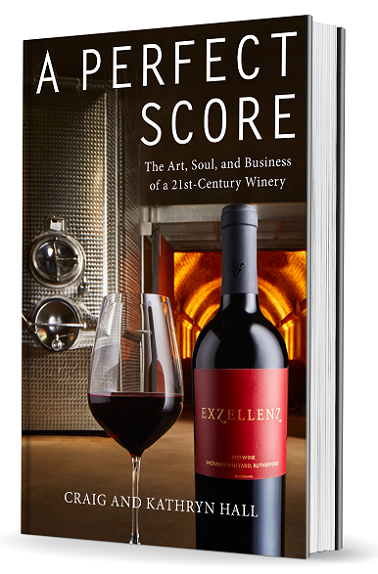 The book is subtitled as "The Art, Soul, and Business of a 21st-Century Winery," and their tale encompasses all those aspects, with an emphasis on the business end. 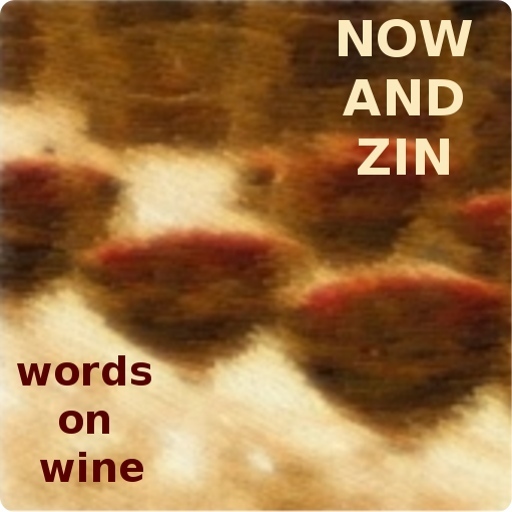 After all, a book touting your 100-point wines is not written as a matter of idle chatter. It's written to raise awareness of the winery through one the use of the best-possible "shelf talkers." The Napa-Valley couple both come from the business world, but Kathryn's family has roots in Mendocino wine. The HALL wines are Bordeaux varieties, while the WALT line covers the Burgundy grapes of California's cooler regions. Their wine shops are bursting forth with highly-rated bottles from both sides of the vineyard fence. In A Perfect Score, the Halls give a breezy look at how they came to make wines that would win over the critics. They also touch upon the Napa Valley's tug-of-war between localism and tourism. That's probably one of the more interesting threads to follow as California's first great wine region still struggles through its growing pains. Art comes into play, as the Halls use artwork to enhance the winery experience. 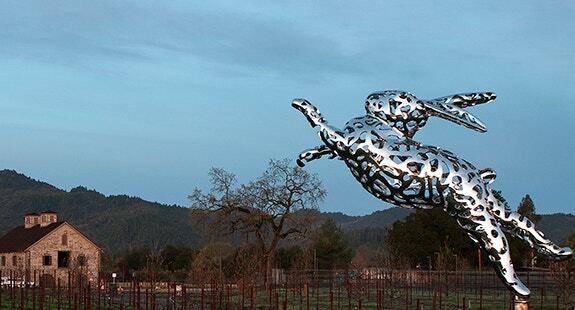 At their St. Helena location, there is a 35-foot-tall Bunny Foo Foo sculpture greeting visitors, one of the many works of art adorning their wineries. The book also discusses how the Halls have created a completely organic, green winery. They say their St. Helena winery was the first LEED Gold Certified Winery in California. Which wine to pair with Indian food is always a hot topic. There's a lot of debate on the subject, with many people, myself included, usually opting for beer. And why not? Beer is just about perfect with spicy cuisine, especially India's pale lagers like Kingfisher or Taj Mahal. Most Indian restaurants seem to recognize the challenge of pairing wine with their food and give up. Some present a thoughtful wine list full of great choices to complement the meal. In Los Angeles, Cardamom does it that way. Sommelier Stewart Prato's choices are decidedly Francophile, and they all seem to hit the intended target in the bullseye. On my last trip there I had a Côtes du Rhône with my lamb and spinach dish. I usually go with a white wine at an Indian restaurant because I feel they work better with spicy food. Since this dish didn't advertise a lot of heat, I tried the red. I'm glad I did. The 2011 Domaine de la Janasse Reserve is a Grenache-heavy blend that also includes Syrah, Carignan, Mourvedre and Cinsault. Winemaker Christophe Sabon apparently put this cuvée together especially for an importer and is available only in the U.S. It is said to better than the one he sells in France, and it costs under $20 retail. The Janasse Reserve shows a medium-deep ruby color, and delivers aromas of bright cherry, with a touch of tar and meat. Flavors of blackberry liqueur meet earth and minerals. Tannins are low and the oak is barely noticeable, musts for an Indian food pairing. The Quincy AOC of France’s Loire Valley only produces white wines. The village is located on the Cher River, which feeds into the Loire. Sancerre is close by, and so is Pouilly-Fumé, so you get the idea. There is good stuff there. Quincy - it rhymes with "Nancy" - has been an AOC longer than any region except Châteuneuf-du-Pape. World War II interrupted viticulture in the region as the Cher River was a natural barrier between occupied and unoccupied France. As a result, most of the vineyards were abandoned and not replanted until the 1980s. This 2014 Tres Vieilles Vignes sells for under $20 online. It hits a pretty reasonable alcohol content of 13% abv. The wine looks pale greenish gold and has a nose of citrus and minerals. The palate shows herbal notes, grapefruit and a green quality that is very fresh. Vinho Verde is the region, not a grape or a style of wine. It's in the northwest corner of Portugal. It's as if you’re saying, "I think I’ll have a Burgundy," except you’re having a white wine made somewhere else, from grapes you've probably never heard before. The grape varieties used in making white Vinho Verde are usually Loureiro, Arinto, Trajadura, Avesso, and Azal. They also make red and rose in the region, and all are youthful wines intended to be consumed soon after bottling. In fact, Vinho Verde means, "green wine." It’s not a color reference, but a suggestion that the wine is quite youthful. Owned by the Guedes family, the Aveleda winery has been in business since the 1870s. The business is being run by fourth-generation winemakers now, with the 5th generation waiting in the wings for their turn at the helm. We ceremoniously unscrewed the cap on this one during a picnic at the Hollywood Bowl. It was perfect for the occasion, crisp, light and refreshing. The wine sells online in the $10 range, sometimes well below that. There is a low alcohol content of 9.5% abv, typical in the style. It features a great, lemony nose with a palate that is refreshing and citrus driven. Minerals lead the way right through the sip into the finish. Here is a different stroke from the Vinho Verde appellation of Portugal. The estate, Quinta da Aveleda, has vineyards, of course, but the grounds also feature gardens, parks and art pieces. It is one of two winemaking centers the Guedes family operates in Portugal’s Vinho Verde region. This wine is called Vinho Branco - white wine - and has a higher-than-normal 12% abv number for alcohol. The 2015 Aveleda Vinho Verde Alvarinho is richer than other Vinho Verde styles, owing to the use use here of Alvarinho, or Albarino, grapes. shows pale in the glass, and gives aromas of apples and citrus, with a hint of flowers and minerals. On the palate, the flavors run toward apples, peaches, orange peel and Meyer lemons with an acidity level that is refreshing, but doesn’t rip anyone’s taste buds off the tongue. Sicily’s wines are, in a word, amazing. The grapes that seem placed on earth specifically for use on that island make delightful wines. It’s no wonder that every civilization through time has wanted a piece of Sicily. Sure, it stands guard over the Mediterranean Sea, but they were after the wine, no doubt. These particular grapes, in Firriato’s 2014 Altavilla Della Corte Grillo, are grown in the "countryside of Trapani," says their website, on the Borgo Guarini estate residing on the western coast of Sicilia. They heap a lot of praise on the estate, as can only be carried off unflinchingly in an Italian winery’s press blurb: "The wonderful, sun-drenched Guarini estate is a daily reminder of the magical powers of creation possessed by the universe, capable of transforming drops of rain and sweat into a dynamic wine recounting the most captivating tales of an insular terroir." Sign Me Up! After harvest from the clay-based soil, the vinification process ends with three months of aging in stainless steel, in contact with the spent yeast cells, which are stirred daily. This imparts a fuller, rounder mouthfeel to the wine without sacrificing acidity. It hits 12.5% abv for alcohol content and it looks to sell online for around $15. The 2014 Altavilla Della Corte Grillo Firriato is loaded with minerality. The lemon-lime and "wet rocks" notes really are appealing. There is also a sense of dried apricot that comes through. On the palate, the acidity is fresh and razor-sharp and the minerals make an even stronger push. I even pick up a note of the sea in there, but that happens every time I drink Sicily. It may be a trick of the vine. Pair this with shrimp scampi, sautéed calamari or escargot for a real treat. Turley Zinfandel? Sure, Which One? Don’t you love it when you show up for drinks a friend’s home, nice bottle of wine in hand, and they say "I've got a shipment from Turley coming, so why don’t we kill off that last one in the rack?" Placing down my bottle behind a toaster, I say that I hate to hear of someone having trouble getting rid of their excess Turley. Stumbling toward the wine chiller, I blurt, "Where’s it at?" A Zinfandel from Turley Wine Cellars is a special thing, always. I’ve never had one of their wines that left me without superlatives. I don’t think I ever will. And there are plenty to try. Turley shows more than two dozen Zinfandels currently for sale. Lodi's Kirschenmann Vineyard is owned and dry-farmed by Turley winemaker Tegan Passalacqua. The vines grow on their own rootstock in the sandy soil of the Mokelumne River AVA, ungrafted, as they have since 1915. They are protected from the heat by the river's waters and the cooling delta breezes. I understand that Mondeuse and Carignane are in the vineyard as well, a field blend of "mixed blacks" commonly found in California's older vineyards. The Carignane, I get. But Mondeuse is a pretty rare grape from the French Alpine region of Savoie. I have never heard of that grape being included in those old-school California field blends. The vineyard has drawn praise from the likes of winemaker Pax Mahle, who called Kirschenmann Zins "pure, linear, streamlined" a couple of years ago. Passalacqua calls his 2012 vintage, "a very feminine wine – the opposite of what many people think of Lodi." He adds that it really is a Lodi style of wine, "just not what most people expect out of Lodi." The wine hits a Lodi-like 15% or so abv, but you’d never know it. There's not a moment of heat in the sip. Turley's 2014 Zinfandel Kirschenmann Vineyardis Zinfandel is lovely, with red fruit, lavender and pepper spice on the nose and a palate that is deep and rich with those qualities as well as a savory herbal mint note that runs deep. The tannins are silky smooth and the finish is long and languid. The fainting couch on which I sat was perfect, for I felt I might give way at any moment. It’s a $60 wine that earns its price tag. This Applegate Valley wine, the Troon Blue Label Estate Tannat 2013, is from the dirt of southern Oregon, estate-grown, and it puts Troon’s general manager, Craig Camp, in mind of the wines of Madiran. As well it should. It's as black as wine gets, like the wines of that French region. Also like Madiran, it's Tannat, and it comes with the expected tannic structure for which that grape is known. His Troon Malbec had the same sort of effect on him. The Oregon terroir offers a racy acidity and a strong fruit presence, with alcohol at the bargain rate of 13,7% abv. It retails for $29. This dark, indigo wine - actually, no light gets through it, so let's call it black - smells of the blackest blackberries and earthiness earth. There’s a smoky touch to the nose and a hint of black olives, too. On the palate, it's pretty explosive. First of all, the tannins couldn't hide if they wanted to, and they don't want to. Have a steak ready, heavily marbled. Flavors of brambly black and blue berries, plums and black raspberries come forward from their earthy home and carry a savory mineral streak with them. Berries remain on the finish. The back label of the Troon 2013 Blue Label Malbec, Rogue Valley explains that Malbec "loves the granitic soils washed down from the Siskiyous in the highlands above the tributaries of the Rogue River." The grapes came from Troon's estate and the Varner-Traul Vineyard. The two were vinified and aged separately before blending. Alcohol ticks 13.7% abv and the wine retails for $29. General manager Craig Camp likes to think of the wines of Cahors and Madiran. "Black wines" they used to call them. Nowadays, he says, dark color is the norm, not the exception. "Obviously we are not making Cahors and Madiran, in Oregon," he says, "we are making Applegate Valley" with echoes of those places in it. He credits the area's unique climate and distinctive granitic soils. "The naturally softer tannins of the Applegate Valley also help refine the more edgy side of these varieties." Camp says the wine is a signpost to a new direction, a new style of winemaking at Troon, one that includes "natural yeast and malolactic fermentations and minimal use of new oak." The Troon Rogue Valley Malbec is a deep, dark delight. Inky black, this wine offers a nose of black raspberry, blackberries and black olives. There is smoke at the top of the glass. The savory notes carry over to the palate, with a dusty, earthy side that barely tips the balance from the fruit. Earth lasts long on the finish. Good Oregon earth.